Place potatoes in large saucepan. Cover with water and boil until tender, about 20 minutes. Drain and cool. Combine sour cream, parsley, vinegar, celery seed, salt and pepper; mix well. Stir in blue cheese. 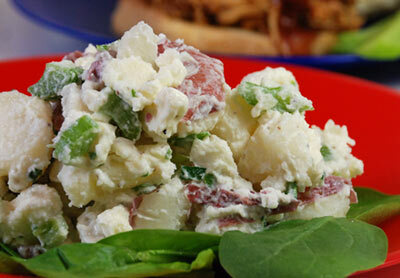 In large bowl add potatoes, celery, green onion, water chestnuts and spinach. Pour blue cheese mixture over potatoes; toss lightly.